Soccer is a beautiful sport. Regardless if you know how to play it or love to watch the game, soccer brings people from all over the place together with a common interest regardless of who you are. 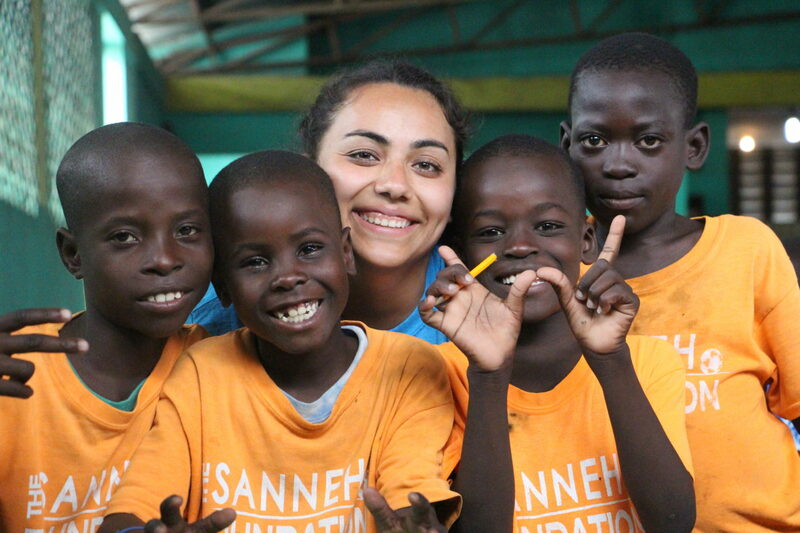 The Haitian Initiative is an amazing program that brings the community of Cite Soleil together and empowers many children coming from very poor living conditions and food instability. For a few hours every day, the kids are able to escape the struggles and hardships they may be facing at home once they enter the building of HI. The room is filled with loving and caring adults who want the best for the kids. As we walked through Cite Soleil it was very tough to see exactly where the kids live because some homes are just a small room for a family of 4+. Kids are walking barefoot down the street where glass or rocks are on the ground. The Haitian Initiative provides these kids with a safe place to get a meal a day that maybe their families might not be able to give them. HI also has English lessons for the kids which is beneficial to them and their personal growth. I sat in on a few English lessons and I could see how eager they all were to learn English and excited they were to make conversation in English with what they knew so far. Having a soccer field just behind the main building of HI is another safe place for them to be themselves through soccer! Being able to see the kids out on the field practicing in the blazing hot sun on the dirt field with a smile on their faces was something that brought me so much joy. Even seeing the kids who are the goalkeepers of the team during small sided games committing to a dive for a shot on the gravel just to make the save. Knowing that these kids are there because they want to be there and really love soccer is the heart of the program and the hearts of the kids. As soon as someone walks into the main room of HI it is filled with smiles and laughter. Some kids are walking around the room while other kids are eating or sitting together with their friends having conversations. After a couple days of visiting Cite Soleil and HI many kids started remembering my name or recognized me from the previous days. On day 4 I could hear some boys and girls screaming my name. It was a good feeling to know that within the span of a couple days the kids remembered who I was and some even ran up to me to give me a hug or to do a handshake I taught them. Some stood there and gave me the biggest most beautiful smiles ever! These kids are fearless and have so much confidence in themselves. It has been an amazing experience to meet the coaches and people in the community who are willing to open up to us who are strangers to them, and the fact that they are so welcoming and approachable made this experience with HI unforgettable so far.